Today marks the start of the annual Organic Fortnight and to celebrate, I'll be showcasing an organic beauty product each day for the 2 weeks. Whether you're dubious about the effectiveness of organic beauty or already a die-hard fan, I hope you'll enjoy the reviews and look forward to hearing your thoughts. First up, The Body Shop's Nutriganics range which I've chosen as an introduction because The Body Shop is everywhere and therefore, it's an easily accessible brand if you're looking to try organic beauty. 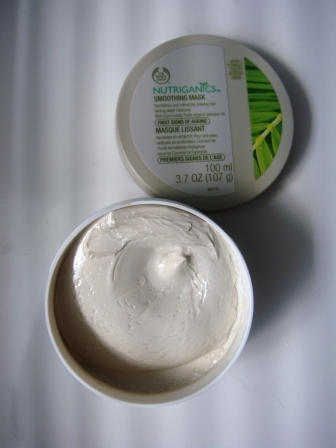 The Nutriganics range was launched in October 2009 and carries the well-respected EcoCert mark. Given that The Body Shop was always at the forefront of campaigns such as Against Animal Testing and Fairtrade (Community Trade), I've been disappointed that it's taken them this long to release an organic beauty line and that the range is so limited, having finally arrived back in 2009 when organic beauty was already well within the average consumers' consciousness. Nutriganics has been specially designed to target the first signs of aging and with prices starting at £8, it's affordable organic skincare. 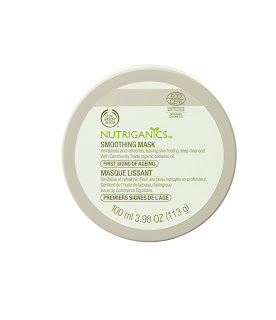 I was sent the Smoothing Mask to try which is described as an intensive cleanser to leave skin feeling smooth. The ethical credentials don't stop at the 98% natural and 42% organic ingredients as it also contains fair trade organic Babassu Oil from Brazil, fair trade organic sugar from Paraguay and fair trade organic olive oil from Italy. Presented in one of The Body Shop's recognisable tubs, it's sleek albeit not particularly luxurious. 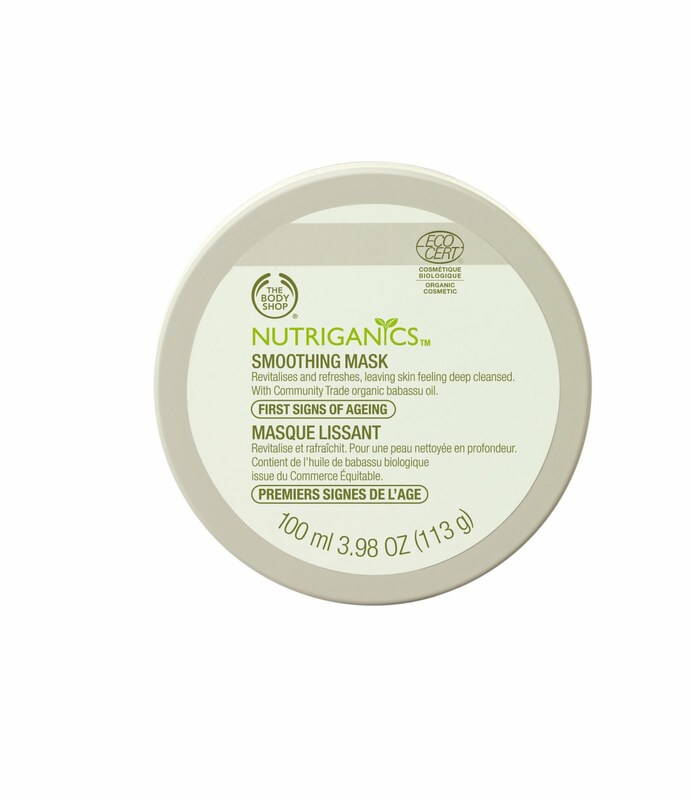 The mask itself is a clay based formula which I found quite thick and therefore difficult to smooth over my face. It has a pleasant, fresh scent which reminded me of more expensive products. After the directed 10 minutes, the mask hadn't completely dried onto my skin so it remained comfortable with no tight feeling. I needed to moisturise afterwards but I certainly didn't feel that my skin had been stripped, which it can with some clay products. I always find clay based masks difficult to rinse off but this wasn't TOO bad. Being clay based, it's inherantly going to give your skin a deep clean so I find the description a little overzealous, plus I expected some exfoliating benefits given the "smoothing" description and although it contains sugar, I didn't notice any granules within the mask, nor did I feel that my skin had been effectively exfoliated. At £14, you get a fair amount of product for your money and a little goes a long way (I think you'd get at least 10 masks out of the tub) so in that respect, it's good value for money. However, I'd personally prefer to invest in something more results driven.